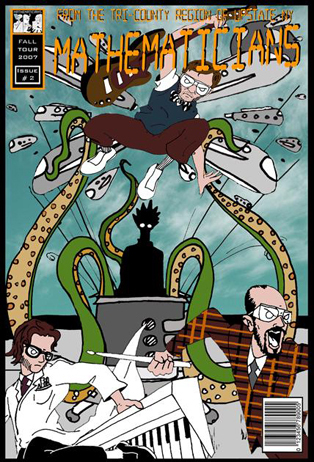 "Mathematicians: Transdimentional Odyssey of Doom" is a feature-length animated Rock-n-Roll tour of the universe. Follow The Mathematicians, as they try to stop the evil machinations of the all-mighty Grimlocks, while performing live music across America. The film includes 10 live songs featuring footage compiled from over a 100 shows with live VJing by Jonathan's alter-ego, Dr. Jonathan Phelps. With animation illustrated by Corey John Sheerer, Joel Barlow and Jonathan Phelps. Order your DVD copy at www.filmbaby.com today!